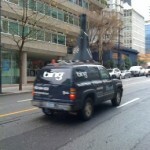 A car taking photos for Microsofts Bing Maps images, similar to Google StreetView, has been spotted in Vancouver, Canada today. When Bing will release images is not clear yet, but we hope it’s soon. Since they are now getting images from Vancouver, my guess is that it will be ahead of the winter Olympics in this city. I believe it will have a different name than “streetview” though. This is surely a biiig van 😉 No very easy to manage when it wil come to bridges and narrow streets! Images on Bing are nice, though!